Moist, but not overly so. A hint of sweetness. Use a whisk to combine flour, cornmeal, sugar, baking powder, and salt in a bowl. Make the flax egg in a separate small bowl (combine ground flax seed and water; allow to sit for a minute until it gels -- it should be goopy like an egg white). Combine almond milk, oil or applesauce, and flax egg. Gently fold this wet mixture into the dry mixture only until all ingredients are wet -- do not use a mixer or over-stir. Batter will be thick. 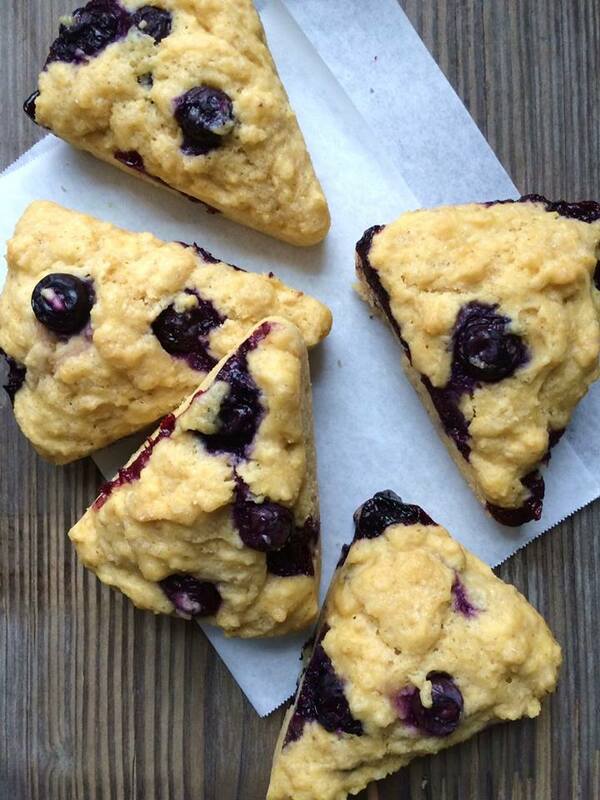 Gently fold in frozen blueberries. Let batter rest for a minute; it should be thick yet fluffy/airy. Optional: Sprinkle top with decorative sugar crystals for a touch more sweetness. And classiness. Bake for 20 minutes (toothpick inserted should come out clean). Let cool for 10 minutes before removing from pan (or just go for it). In Breads, Muffins, and Scones, Breakfast. Bookmark the permalink. These look so yummy, Lisa! Will give them a try. My wife and I have been full vegans for about three years now and love it. So many good reasons to go vegan. Reading your “About Page” was very interesting. Sounds very much like the way we have decided to live our lives. Vegan, but not doing without the things we love to eat. It’s working out *great*. Thank you for making your site available for people to learn from! Cheers! Thank you, Douglas! I’m glad things are going so great for you and your wife. Having a plant-based diet turns out to be a very easy thing to do (once you know what you’re doing). Cheers!